For months now, the US Copyright Royalty Board—a three-person government panel that decides how much online radio services have to pay to play artists’ music—has been mulling a tough decision: Increase music licensing rates for the next five years, or lower them? While artists and record labels pushed for higher fees, webcaster services like market leader Pandora insisted on the opposite. 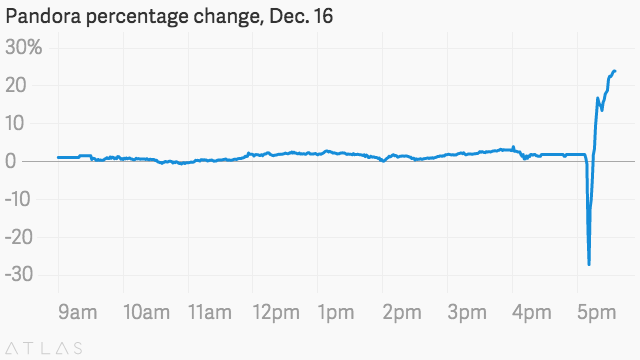 Today (Dec. 16), the CRB announced those new rates, and they are not exactly in Pandora’s favor. While the royalties cost for streaming songs on a subscription platform has dipped a bit, the cost for streaming songs on the more popular ad-supported free-user platform is now higher. These fraction-of-a-cent changes may seem negligible, but they amount to millions of dollars a year. Last year, Pandora paid $446 million in music licensing costs alone—roughly half of its $921 million revenue. 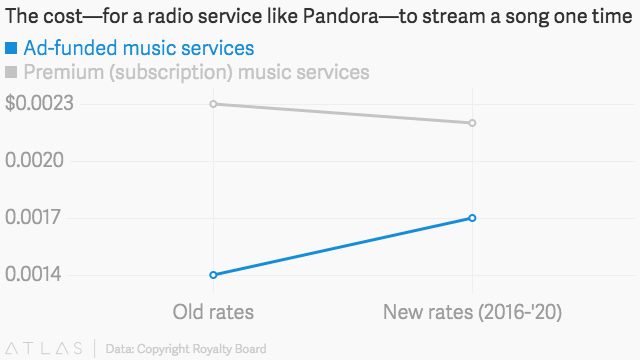 The increased cost for streaming songs on an ad-supported platform means Pandora will have to dip even further into its revenue stream to pay record labels and artists, in the next few years. “This is an issue of fundamental fairness,” David Leichtman, a lawyer who specializes in arts-related matters, told Quartz in an email earlier this week. “Fairness to the talent who creates the music and fairness to the labels who invest in incubating, guiding the development of, and distributing that music.” Lower royalty rates would have discouraged artists from investing in the creation of music itself, he adds. But all in all, the rate increase is not as dramatic as it could have been: SoundExchange, the royalty distribution platform that represents artists and record labels, had asked the CRB for a rate of $0.0025. Pandora had asked for $0.0011. The new rate, $0.0017, is almost exactly in the middle. And Pandora is also not unprepared. It’s been gearing up for a potential CRB rate hike for a while now, as Wired notes, signing new agreements left and right with music publishers to get in their good graces. Pandora also swallowed up on-demand music service Rdio last month, after buying a music analytics service, Next Big Sound and a concert ticket platform, Ticketfly. These events point clearly to the company’s determination to reclaim its top spot in music streaming, which is the fastest-growing part of the music business right now.